Adapted by the author, David Almond’s marvellous, mystical children’s novel translates well to the stage. Michael (Sam Swann) is an unsettled young boy, who discovers a mysterious creature in his garage. Swann plays him with a conviction that is truly engaging. The moment his mum (Tina Harris) coaxes him to put both hands into the incubator to touch his new-born baby sister is heart-stoppingly tender. He is well paired with Kate Okello, as Michael’s redoubtable friend Mina, who knows all about evolution and Blake and loves the night. The narrators are always on stage, sometimes silent observers, sometimes energetic presences. They drop down from their vantage points to become tormentors in the school yard or comic crones in the hospital. Frankie Bradshaw’s towering set of branches and brushwood is built like a den. It also contains echoes of a stable, appropriate in this tale of nativity. Unlike in a pantomime, where flying is primarily a source of fun, here it has a deeply mystical dimension. 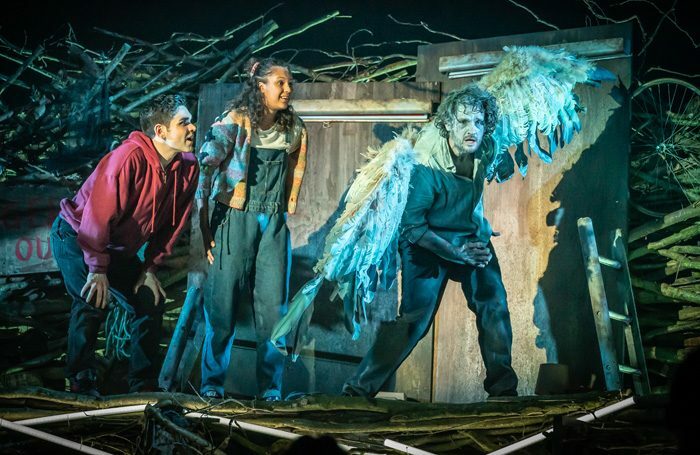 When Skellig (Edward Harrison) unfurls his great wings, he visibly evolves from the hunched, hoarse and angry figure that Michael first encounters. The flickering neon lights above his refuge suggest the fragility of life. The story works on many levels and the pace of Lisa Blair’s production reflects this, shifting from the breakneck speed of the comedy scenes to those of characters patiently listening for owls in the darkness. Beautiful.